We use a microwave (MW) plasma torch Litmas Red powered by a 5 kW magnetron for various uses. 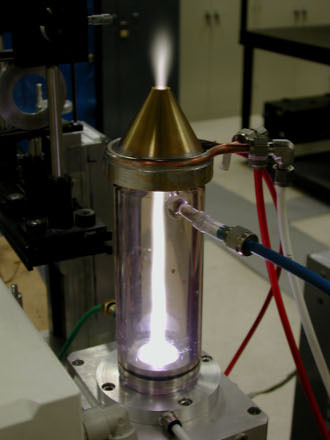 This torch produces an atmospheric pressure plasma jet in air, nitrogen or other gases and one of the purposes is running DC discharges in the preheated air at atmospheric pressure for plasma scaling applications. 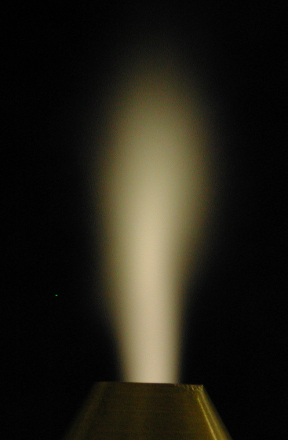 The torch has a maximum power output of 3 kW. The temperature and velocity of the outgoing plasma can be set by varying the power output and gas flow rate, as well as by using water-cooled test sections and nozzles. The torch is able to generate air plasmas in the temperature range 750-4700 K at flow velocities from 20 to 1400 m/s, corresponding to gas flow rates from 8 to 110 slpm (standard liters per minute). 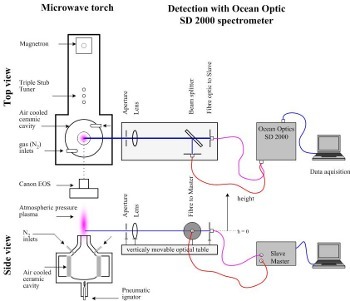 The microwave torch head and a close-up view of the air plasma plume at typical experimental conditions (T~2000 K) are shown in Figure 1. Contrary to standard MW torch geometries (where the gas flows upstream the cavity perpendicular to the MW wave guide), we use special nozzles where the gas is inserted via two tangential inlets on top of the MW cavity. 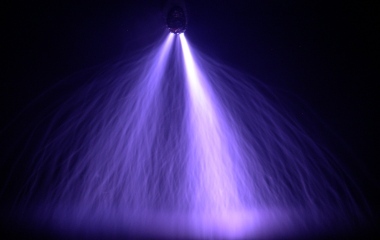 Plasma produced in the torch swirls up tangentially through the nozzle. We tested several nozzles with different gas inlet angles and diameters. Fig. 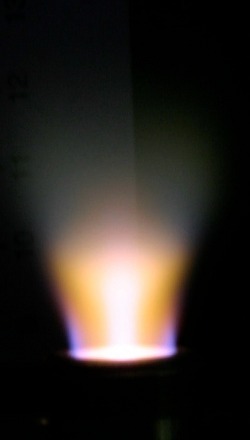 1. a) Microwave plasma torch head, test-section, and accelerating nozzle (exit diameter 1 cm). b) air plasma plume, c) nitrogen plasma plume. 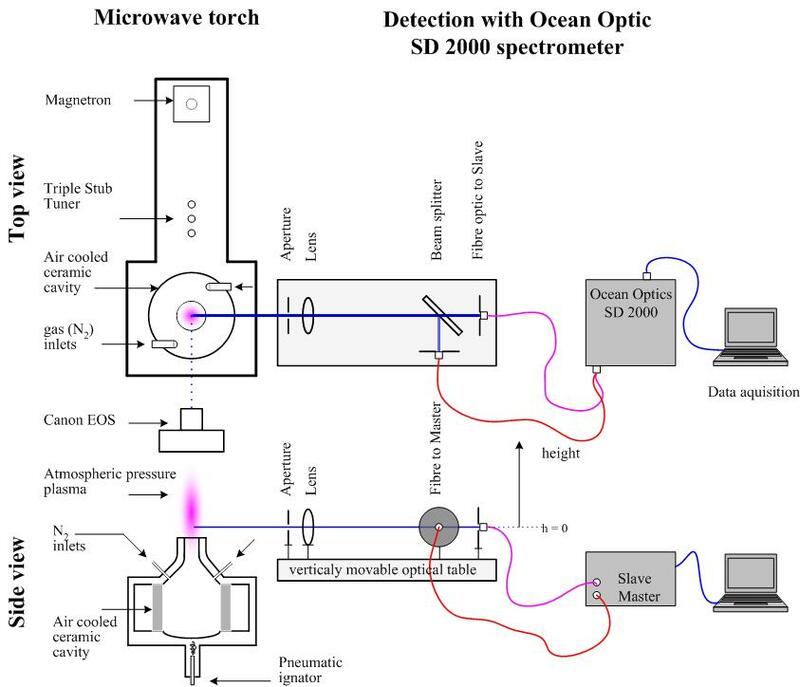 We carried out a spectroscopic characterization of atmospheric pressure microwave plasma jet in nitrogen. The experimental set-up is shown in Fig. 2. Varying MW power and gas flow rates results in varying plasma jet sizes and properties. The more energy is inserted in the flowing gas, the greater emission and higher plasma temperatures are obtained. Axial vertical profiles of the emission intensity and photo-documentation characterize the evolution of the jet in space. At high gas flow rates (50 l/min), the conical shape of the jet collapses into a funnel-like shape. Fig. 2. Experimental set-up for MW plasma experiments and emission spectroscopy. Plasma temperatures were determined by comparing experimental and simulated spectra of CN, which was found a dominant radiative system due to carbon impurities. We also identified emission of N2 molecules, N2+ ions and NO radicals. We measured the emission intensities in various horizontal positions from the vertical axis (radii r) with 1 mm spacing. We then applied Abel inversion to obtain radial emissivity profiles. Radial emissivity profiles of N2, N2+ and CN were radially symmetric and showed that the emissivity decreased with the increasing r and h, except for NOγ profile that was not symmetric. We found the maximum emissivity of NO in a certain r, possibly because the plasma was spiral-twisted and entrained the surrounding air. 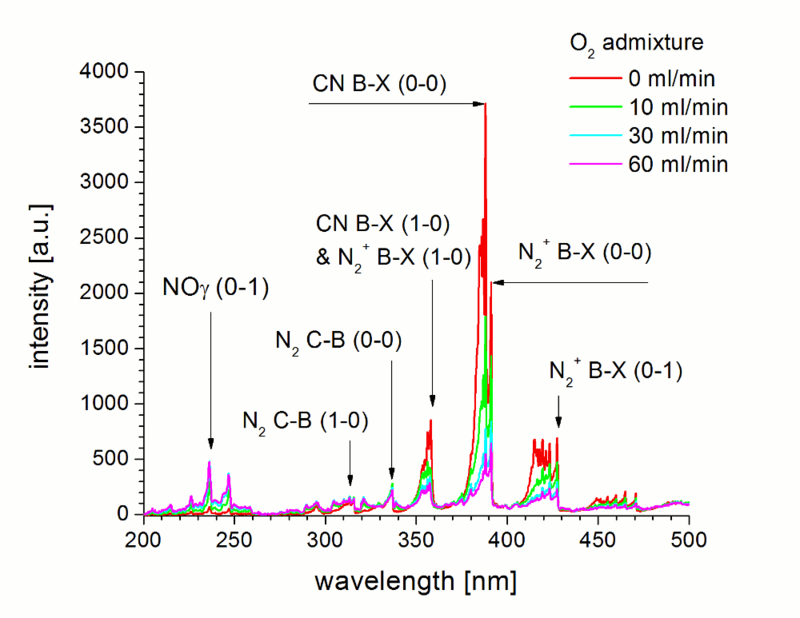 A small admixture of oxygen results in the decrease of CN and increase of NO and N2 emission, which indicates a different excited states chemistry (Fig. 3). Fig. 3. 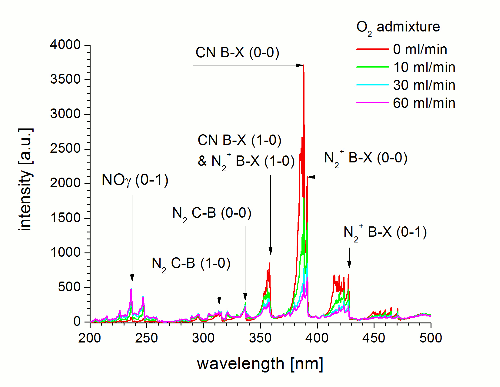 UV emission spectra of MW plasma in nitrogen with small O2 admixture. P=1.46 kW, Q=26 l/min. These results serve as a platform for further experiments aimed at environmental, technical and diagnostics applications of MW plasma jets. So far we tested the application of the MW atmospheric pressure nitrogen plasma for the benefication of carbon waste.